Adolf Hitler was a man filled with hate, paranoia, and ludicrous notions of what his country could achieve if it became an international power. But he was also sly and canny, a man who used his vocal gifts to hypnotize his fellow Germans. Not long after taking power, he convinced his countrymen to join him “once more into the breech,” to quote William Shakespeare’s Henry V. Thus, in 1939, the Nazis invaded and occupied Poland, in large measure because Hitler was able to convince others that the Third Reich was invincible. 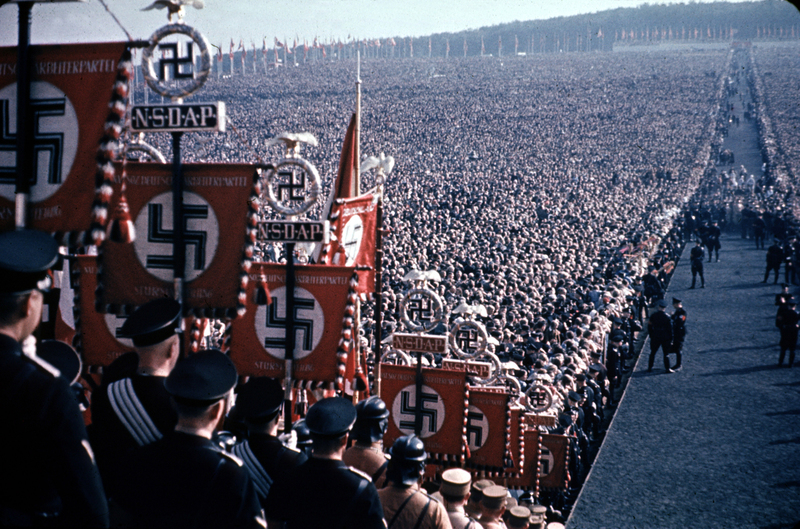 Hitler knew that his power lay, at least in part, in his ability to persuade almost anyone of almost anything. Because of that, he must never, ever allow his voice to be caught relaxed, unaware, or “off script.” In other words, when he wasn’t orating to the masses, he would not allow anyone to record him as sounding like anything other than a military mastermind. We have many examples of Hitler shrieking into a microphone, pumping his fist against a dais, and opening his arms skyward as though calling down the power of Zeus. But what is less well known is that once, just once, his actual speaking voice was recorded–he didn’t know it happened and neither did his fellow Nazis. The man who made the recording, Thor Damen, likely had no idea he was making history by recording Hitler speaking, if not calmly, then certainly plainly. Damen was given an assignment by his employer, Yie Broadcasting, to record the birthday speeches at a special supper held on a private train in June 1942, in Imatra, in southern Finland. At the event, Hitler met with Marshall Carl Gustaf Emil Mannerheim, the Finnish commander to whom the train belonged. All the people in attendance, including Hitler, knew the birthday congratulations and speeches were being recorded, but what no one knew was that Damen left the machine running and caught on tape an 11-minute conversation between the Hitler and Mannerheim. Hitler wanted Finland, which was still neutral in 1942, as an active ally against the Russians. Knowing this, Commander Mannerheim was loathe to give the impression to the Finnish people that he was hosting Hitler in anything other than a social way. Hence, he had his train sent to the Immola Airfield, where he and some members of the government, including President Ryti, listened closely as the German leader blamed everyone around him, even the weather, for how badly the war was going. Interior of the saloon coach where Adolf Hitler and C.G.E. Mannerheim met in 4 June 1942, Sastamala, Finland. If Hitler had not been at the birthday supper with an agenda to persuade the Finns to join him in his battle on the Russian Front, which was going badly, it’s quite possible the tape would not have existed. It is the only surviving recording of Hitler’s “regular”–one hesitates to use the word “normal”–voice. During the conversation, the men discuss many aspects of Germany’s incursions: how Germany defeated Italy in North Africa, how Operation Barbarossa failed, and much more. On and on go the excuses, the blaming, and the rationalizing. He even launches criticism at Finland’s President Ryti: “I told your president before…I had no idea…[but] I would have taken the position to invade anyway because there was no other possibility. It was the winter of 39/40, I had only this nightmare – but there is even more. Because a war on two fronts…that would have broken us.” And, as history taught us, it did break him. And so it goes, Hitler talking, wheedling, and excusing himself, and Mannerheim listening, for the most part. One wonders if he knew, then, that he was hosting a madman. Listening to Hitler speak is an eerie, almost haunting experience. Most of the world has listened to his political speeches and diatribes about what Germany was entitled to and what the “Fatherland” deserved–or at the very least, we’ve seen him portrayed by actors who capture that rallying menace he used to such great and terrible effect. But listening to him in a day-to-day conversation is different. It drives home the point that Hitler was little more than a megalomaniac in a military uniform. He tried to take over the world, but the world instead took over him. Ultimately he took the coward’s path out of the pain he caused, and left his few surviving sycophants to deal with his legacy.